The Moondreams Purse is identical to Monet's Garden Purse, except that it does not use specific fabric SKUs. 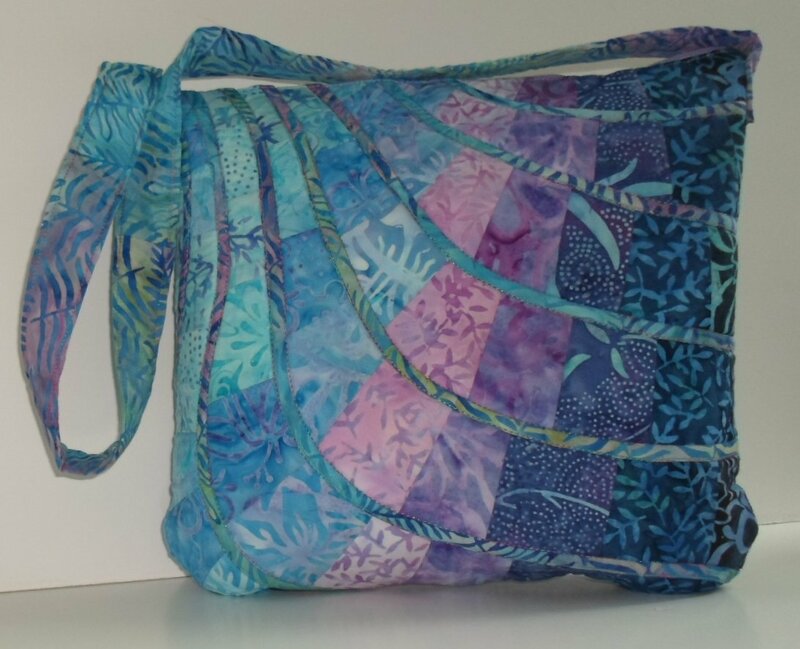 Instead, it is suitable for any 2 1/2" fabric strip sets, using splashes of 10 batik colors that swirl around the front and back of this 12"x13" shoulder bag with zipper top and two inside pockets. The kits come in two colors: pinks and blues similar to those pictured, and shades of light to dark brown (not pictured). The kits contain all the fabrics and pattern to make the shoulder bag. To complete the project you will need: 5/8yd fleece or foam style batting (about 22 1/2"x30") ; 14" zipper; 1 yd freezer paper; sewing and quilting thread; fine tip black permanent marker; chalk fabric marker.